Magda Herzberger shared her story of survival Tuesday to a jam-packed library at Grand Canyon University. Magda Herzberger had a very unusual way of telling a tragic story. 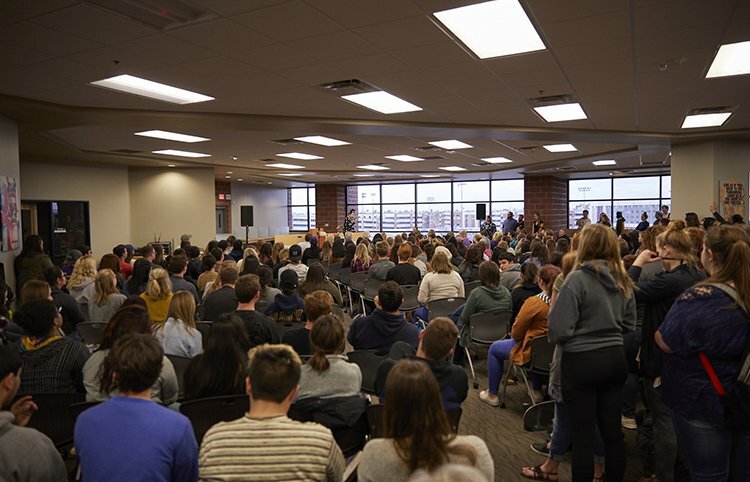 Grinning from ear to ear, the Holocaust survivor introduced herself with that question to an overflowing crowd of students Tuesday on the fourth floor of the Grand Canyon University library. At 92, Herzberger is a whimsical, optimistic woman, full of faith, who believes there must be a reason for her survival against all of the darkness. At 92, Herzberger is determined to keep the memories of the Holocaust alive. Herzberger began her talk by recounting in great detail the pain and constant danger during the Holocaust when she was 18, while still retaining her faith. Around 1940, as she was preparing for high school, Hitler’s Nazi empire had begun construction of Auschwitz, and the gestapo started identifying, imprisoning and murdering Jews and other minorities in multiple countries. As the Nazis seized control of most of Europe, Jews soon were ordered to register with the local government and to tag the yellow star of David (to mark the “dirty Jew,” Herzberger explained) to their clothing. It was April 1944 when a group of local gendarmes, Nazi sympathizers at the time, herded Herzberger and her parents — and other Jews from their neighborhood in Cluj, Romania — onto trucks bound for a ghetto that served as a staging area for deportations to the death camps. There, millions of Jews and other minorities were systematically murdered during World War II. For nearly a year, Herzberger experienced the torture in three of Adolph Hitler’s concentration camps where she served as a corpse gatherer. She knew she had to make it out alive. Herzberger shared that story in a most heartfelt way – by telling it with compassion, humor and grace. The audience nodded, laughed and cried as Herzberger walked them through a mostly harmonious childhood in Transylvania to her battle to victory. Her uncle, an Olympic athlete, trained her to become a junior fencing champion who beat out the boys. From time to time, Herzberger would complain to her uncle about her hard work, sweat and sore muscles. 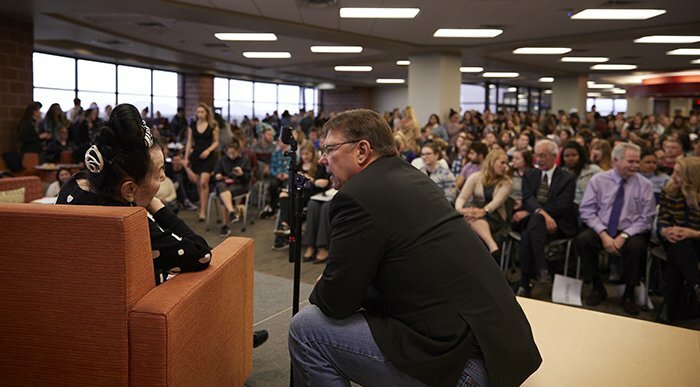 Magda Herzberger and Dr. Hank Radda, GCU’s provost, engage in a conversation prior to the event. Herzberger talked of the special strength that fencing would teach her to have – trust in oneself. She urged the hundreds of students in the audience to recognize the bad breaks in their lives and pray expectantly for God’s intervention in the present. “Do you know what I see in life?” she said. “Never take it for granted. She talked about how after one year of sickness and starvation, she and other prisoners were evacuated and forced on a death march, where some of the extremely weak and sick prisoners would die. Only half of them would survive. It was at that moment in her captivity when she felt at her lowest point. But instead of stopping, she imagined her home. Herzberger was at her physical peak when she entered the Bergen-Belsen camp, and by April 1945 she was exhausted. She collapsed into a pile of corpses and felt she might die. In her mind, she started to create a beautiful funeral for herself at a cathedral. She even pictured angels flying. She told of how the strangest thing happened when she decided to accept death – a British soldier found her, barely alive, during the camp’s liberation. 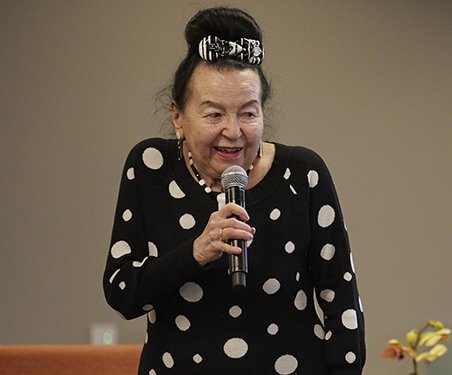 “I don’t know what he saw, but he realized that I was alive and he lifted me up and I was like a ragged doll in his arms … he was crying … and as I barely looked down at the ground of Bergen-Belsen I made a promise to God,” Herzberger said. Herzberger, also a poet and author of 13 books, clearly has lived up to her promise. She wishes she could live to 120 so that she can keep telling it again and again. “I will settle for 100 in the worst case – so we will see what happens,” she said, smiling. Students found hope and understanding in Herzberger’s message. Junior Justin Ortega expressed his appreciation for life. Such a lovely and empowering person! I completely agree with what she advised us. Keeping our faith through the darkest moments is a battle worth fighting/dying for. I know people who have been through a rough life and some of them have been the most horrible people I have meet. But when you keep your faith through it all, you will never let the dark break you. Define you. Change you. I am so grateful that GCU invited her. As a student, I strongly feel that the more connected we are with our world’s history, the more we will improve our present and future. What an inspiring young lady she is. Many years ago I had worked with a lady who had survived the Holocaust as well. She had numbers tattooed on her left forearm. She said the Nazis did that so they knew who you were and how to find you. She would not talk about it much because she hated it and it was such a bad time in her life and wanted to forget about that part of her life. It would really be grand if Magda could travel to schools and tell her story about her life during the Holocaust. I believe more children these days need to understand history, especially this part of it. So glad that GCU asked this lovely woman to share with us. I did not get to personally meet her but I could feel her strong spirit in the remarks she made. I wonder if she has ever met Corrie Tenboom…Who also survived the Holocaust and wrote a book/movie that was very moving. I am still amazed and frightened that humans could treat other humans in this manner…I hope every generation is reminded of this dark spot in our history so that it will never be repeated. 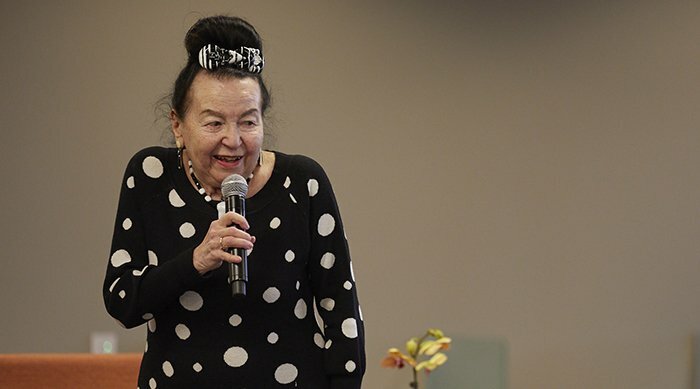 Connie O’neil, this was a great story to share with GCU students and faculty of how a lovely lady survived the Holocaust during the early 1940s. I worked at a Jewish Community in Baltimore MD in the early 1970s and Jewish people would cry all the time about they lost their families during the Holocaust and it took a toll on me. I hope that in the near future that no one has to go through this type of torture. What a great memory, a great lesson, and a great way to lift up other’s spirit! God has a reason for sparring her life. I am blown away seeing a 92 years old looking this great. The holocaust is usually a sad memory, Sometimes you may be tempted to ask why did God allow such evil to befall His own people, but hey! God cannot be questioned, He is the all knowing. We all should learn to be thankful for what we have and not complain about what we don’t have . Thanks Ms Herzberger, more grace to your aging .